The Baker Passive House is a project taken on in collaboration with and for Linda Baker Architect by CX Contracting. Looking for new efficiencies in super-insulated building technique, we extended the capabilities of a panel system that CX has been developing for the past six years. 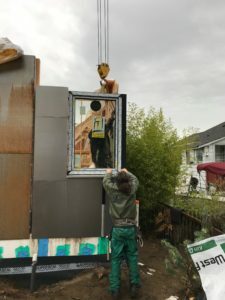 Having constructed two fully pre-insulated, pre-fabricated panelized custom homes, we decided to push the envelope and pre-clad the the structural wall panels. Inspired by the Brock Commons building at UBC, we decided that it could be possible to push the boundaries in residential construction and move to an exterior finished system, controlling many of the airtightness issues with which we are concerned, in shop conditions. In a modified timber-frame infill system, incorporating simple and off-the-shelf curtain wall techniques, we managed to produce a panel system that satisfied the requirements of the architect and move to a high level of efficiency. There has been a lot of testing! And many set backs. Adhesives, substrates, cladding and temperature/moisture changes have been challenging, but we are now confident that these issues have been resolved to produce a robust system. However the build has been a bit difficult. We were ready to start putting the system together at the beginning of the wettest November recorded. As prefabricators, we work to very small tolerances, so moisture and swelling created some slow down in install time. However, every panel fit perfectly, just very tight! A dry summer install would have been fantastic, fast and very efficient. Lessons learned. The roof has been another happy experience with a prefabricated nail laminated timber panel system. NLT allowed the roof to be pre-finished and very quickly installed over four glulam beams. The large spans afforded by the NLT panel system decreased the amount of beams required, creating an amazing ceiling and less time with beam install. Partially adopting a mass lumber approach to the roof also increases thermal efficiency and the simplicity of assembly is really unbeatable. Utility-grade lumber was used in an effort to save cost, and the ceiling looks great. All the EPS insulation is installed over the roof structure, saving labour and adding to the structural integrity of the roof.